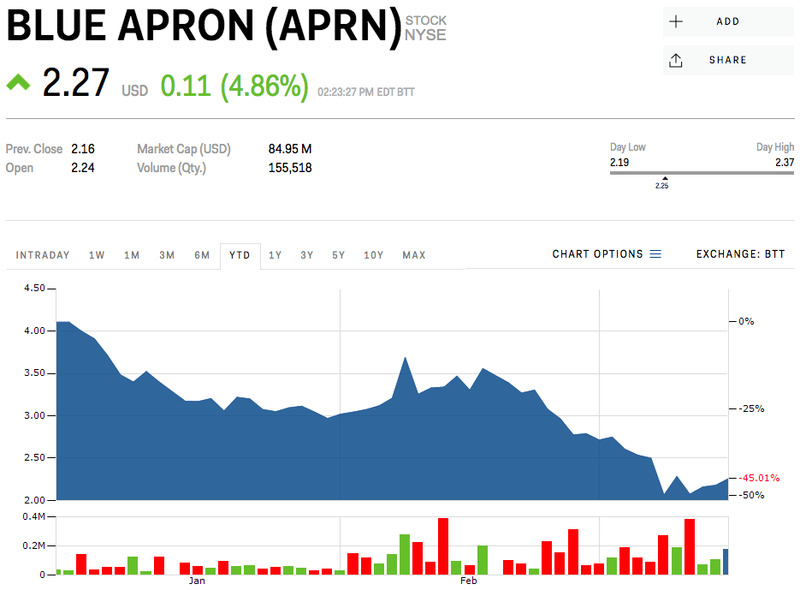 Blue Apron shares jumped on news it plans to sell its meal kits in grocery stores. The company has struggled to attract and retain customers since it went public last year. You can view Blue Apron’s stock price here. Shares of Blue Apron rose 5% after the company said it was contemplating selling its meal kits in grocery stores this year. Blue Apron CEO Brad Dickerson told the Wall Street Journal he believes the company can attract more customers through its subscription delivery model, as well as a-la-carte meals sold in stores and through its website. The company has struggled with attracting new customers and retaining old ones since going public last July. The subscription service reported its number of subscribers fell to 746,000 during the fourth quarter, well below the 856,000 customers it had in the previous quarter. Blue Apron is also facing fierce competition from retail behemoths. A few weeks ago, Walmart announced it was launching its own line of meal kits. The Amazon-Whole Foods acquisition also looms large over the meal-kit company with investors fearing Amazon will continue to expand its offerings through the deal, further taking away from Blue Apron’s market share. Already, the e-commerce giant has filed for a trademark application for “prepared food kits” and offers its own meal-kit delivery subscription service through Amazon Fresh and Prime Now. Dickerson said that he plans to have the product in stores this year. Blue Apron’s shares are down 45.13% year-to-date.